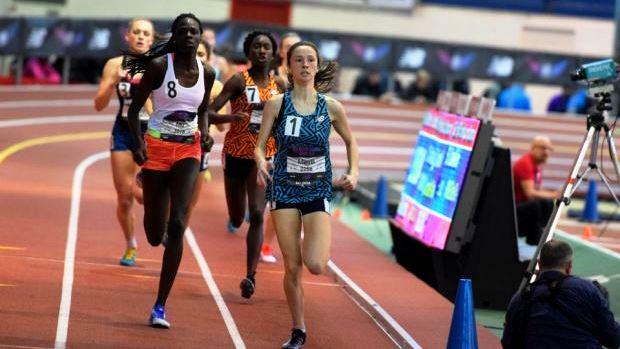 The final day of the New Balance Nationals proved to be the best for Rhode Island athletes. The Ocean State had five podium placements on Sunday, including a trio of runner-up finishers inside the New Balance Armory. Portsmouth's Nikki Merrill nearly stole the show in the 800-meter run, finishing second overall with a personal best of 2 minutes, 7.27 seconds (US #2). Merrill was leading the field going into the final lap before being passed by eventual champion Athing Mu of Trenton (NJ), who was timed in a winning 2:06.59. The remaining top-six performances came in the weight throw. For the second straight year, Ponaganset's Gianna Rao finished second in the girls' competition with a heave of 57 feet, 6.25 inches. Classical's Cheyenne Figueroa finished fifth (53-8.5) and Barrington's Annika Kelly was sixth (53-6.5) to also earn All-American status. Lincoln's Garrett Doyle unleashed a best by more than two feet in the boys' weight with a distance of 74-5. Jacob Furland of Classical was seventh overall with a toss of 68-3.25.